Poor children. They just want to sit and eat crayons in peace, but we're always reading them stories about how they could get gobbled up by monsters, or turned into mice, or sucked down a rabbit hole into an alternate dimension. No wonder they're always crying. When you think about it, quite a lot of children's literature is just plain weird... and sometimes a little bit disturbing. And that's just the stuff that you find in the elementary school library. Here are a few odd, strange, and totally bizarre books that might just qualify as the weirdest children's books of all time. Now, to be fair, a lot of the books we loved as kids were somewhat on the weirder side of the spectrum. Stuart Little is a mouse born to a human woman (what? why?). Alice's Adventures in Wonderland is a whole lot of delightful, fever-dream nonsense. And we all remember those strangely mesmerizing Animorphs covers. Well... in all fairness to Carol Dean, children are no match for fire. And I appreciate that low-key pun with the word "match." It just feels like there could be a better way to frame this fire safety book. Or perhaps a cover illustration that doesn't make the reader feel like Lumière the candlestick is now a deranged serial killer. This is a book about a pig whose head falls off whenever he gets mad. Let me back up: he hates sheep because they have wool, and therefore when he gets mad, his head falls off. Also, he has horns. Now do you get it? No? At one point he pretends to be a baby, and also a plant. It's just a very...weird book. And yes, this is the author who wrote Babar. True story: I had this book as a kid, and it is WILD. So there's this dog named Otto, right? And he's a giant. And there's a Baron who wants to study Otto to improve the quality of his own giant potatoes and roses, because all of his potatoes are full of water. There's a mobile hill that drives around, and at one point Otto is stabbed with spears to determine if he, too, is full of water. I'm sure this book makes sense to somebody, somewhere? Look, I know it's better to give kids the straight forward facts of biology...I just never really wanted to see a drawing of a sperm with goggles on. Where Willy Went is the story of Willy, a speedy little sperm, who is (you guessed it!) seeking an egg. Spoiler alert: Willy wins the "swimming contest" and gets to the egg first, the egg is fertilized, and eventually a baby is born...a baby who has the "same smile" as Willy and who grows up to be a swimmer. I know that's supposed to be charming, but somehow it just feels incredibly creepy. 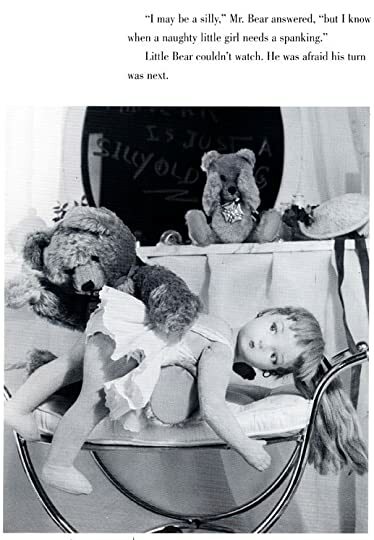 Sure, I mean, if you want to have waking nightmares for the rest of your days, read The Lonely Doll. It's about a doll (already creepy) who lives alone. Then one day a father and son bear show up and just...start living with her and disciplining her and promising to never leave? And it's illustrated with black and white nightmare photographs. This book is infamous for the spanking scene, which just doesn't seem to belong in a kids' book. Did you know that Labyrinth, that weird David Bowie movie, was based on an even weirder Maurice Sendak book? Outside Over There is the deeply strange story of young Ida, who must venture "outside over there" to save her baby sister from becoming a goblin's bride. Yeah, I guess goblins are totally cool with infant marriage. The drawings are creepy, the story disturbing, and the whole book is classic Sendak weirdness. The message of this book is all about gender equality, and we can all get behind that. But they get there... through a peeing circus. See, Little Monkey is so good at peeing that he opens a peeing circus to show off his gift. What follows is a sort of pee-based battle of the sexes, which I'm pretty sure no one asked for. Honestly, after that book about the sperm, a book from the point of view of a fetus doesn't seem that weird. But it's still a little weird. OK, it's very weird (although to be fair, I guess being a fetus must be an incredibly boring job?). Cloudy with a Chance of Meatballs is already a pretty weird book about food-based weather patterns that get wildly out of control. But Cloudy with a Chance of Meatballs 3 is next level bonkers: astronauts land on Mars, and it turns out that it rains pie on Mars. Naturally, the kids want to go and eat Martian rain-pie ASAP. Seems like kind of a weird direction to go with an already weird premise? Remember that adorable kids' book, The Hundred and One Dalmatians? Well, it has a sequel! And what's the sequel about? A worldwide plague that leaves every living creature other than dogs in a coma. Um...OK? The dogs want to help wake their fellow living things from this enchanted sleep so they all get together, create an emergency dog government, and call on a celestial dog being from outer space to help them find a cure. It's... just a tad different from the first book.